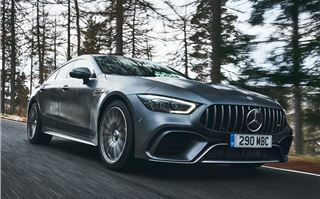 Mercedes-Benz is taking on the Porsche Panamera Turbo with its new AMG-GT Four-Door. Powered by a 4.0-litre V8 engine and with a six-figure price tag, the ultra luxurious Four-Door is an extravagant purchase - but one we think is worth every penny. 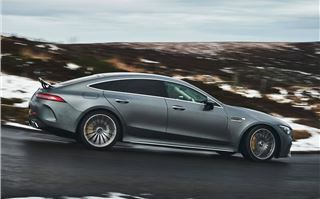 In the standard GT 63 model, tested here, said V8 produces 585PS, while there’s also an even meatier S model with 639PS. The engine is paired with a nine-speed automatic gearbox along with four-wheel-drive, sending most of the power to the rear most of the time, along with four-wheel steering to aid handling. 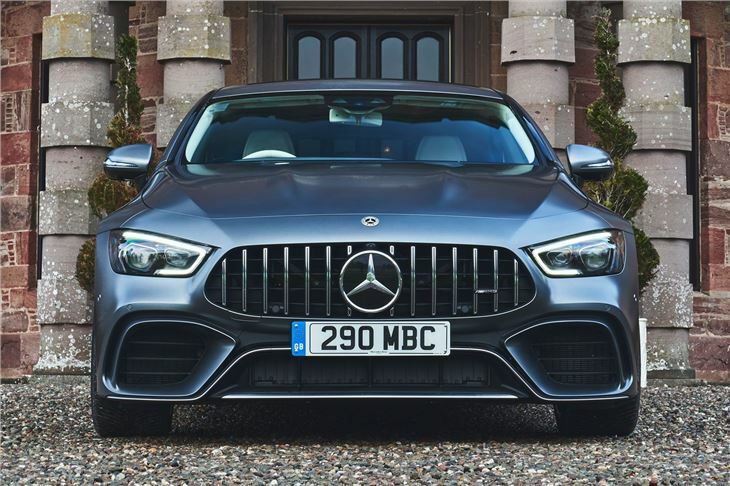 Two six-cylinder models, badged the GT 43 and 53, are sold in Europe - but neither have been confirmed for the UK. Hybrid models are on the cards, but for the time being we’ll have to cope with the V8. And that’s not a bad thing. 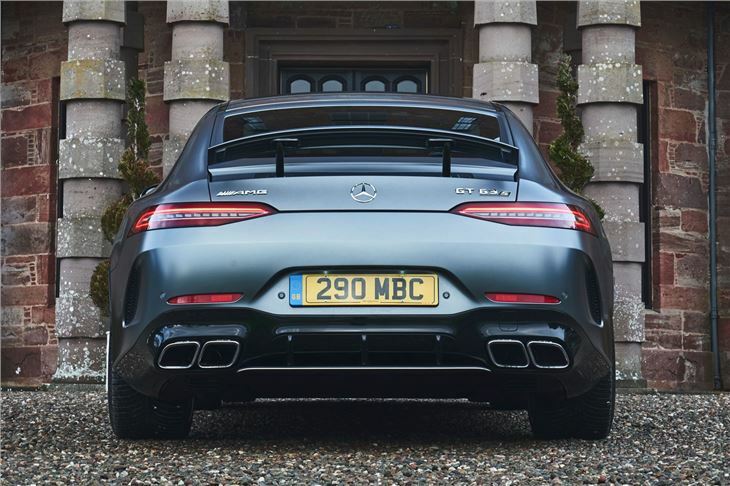 As soon as you hit the GT 63’s start button, its quad exhausts snarl like a proper supercar. You really can’t beat the sound of an eight-cylinder AMG. Acceleration is ferocious, reaching 62mph in 3.4 seconds (3.2 seconds for the S) and a seemingly endless supply of grip. While it’s not surprising that a four-wheel-drive, V8-powered AMG with 585PS accelerates quickly, the way it handles is impressive. All models feature four-wheel steering along with air suspension and - even on the wintery Scottish roads of our test - it copes very well in real-world conditions. The front end is eager to turn in, while the steering is smooth and communicative for enthusiastic drivers. The rear-biased four-wheel-drive system, meanwhile, contributes to a sports-car-like driving experience. One of the few negative points is the ride, which errs on the side of harsh around town, but once up to speed it flows well. 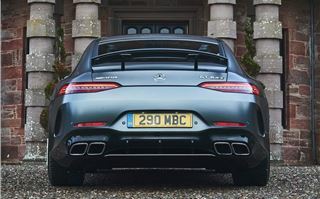 Indeed, when you’re not looking to mimic a Porsche 911 across country, the GT 63 is a most acceptable grand tourer. Its nine-speed automatic gearbox settles on a gear quite quickly, while all the standard driver assistance tech takes the pain out of long journeys. The interior helps, too. 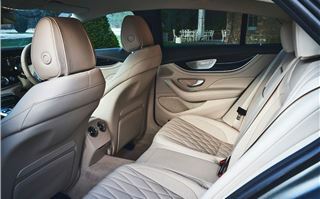 Mercedes-Benz has taken the title of ‘best interiors in the business’ from Audi in recent years, and its GT 63 combines a centre console similar to that found in the two-door AMG-GT with classy features of the bigger and newer models like the E-Class. 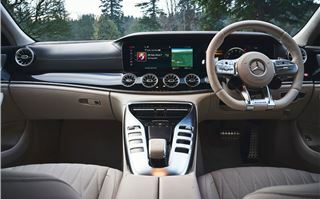 There’s a premium Burmester surround sound system as standard, as well as a 12-3-inch colour display incorporating DAB radio and 3D navigation as well as Apple CarPlay. You sit slightly higher than you may expect, but there’s plenty of electric adjustment in both front seats. Things are pretty good in the back, too. Even for adults, there’s a respectable amount of head and legroom. Children might moan about the relatively high window line, but there won’t be any complaints about how comfortable the seats are. Fancy ambient lighting lets you pick from 64 colours and manages to look quite classy - not a given for colourful interior lighting - and drivers who really want to treat rear seat passengers can opt for the £3695 Rear Luxury Lounge package with its individual seats and a centre console with touchscreen display providing access to the infotainment. 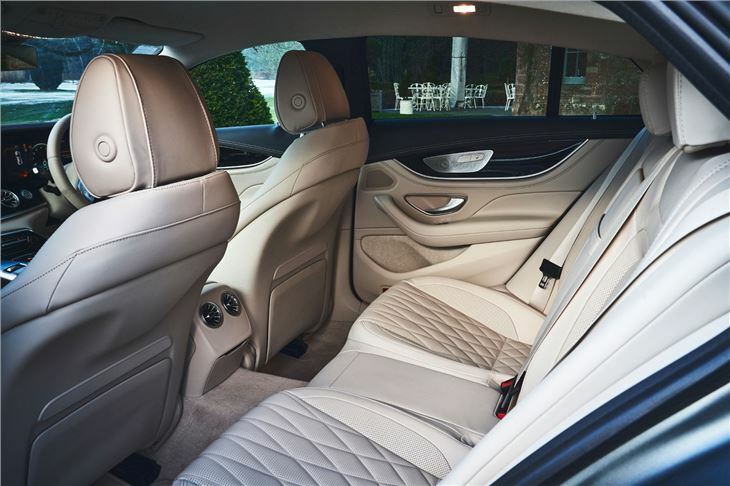 Heated seats are standard in the back, while a respectable 395-litres of boot space is supplemented by an additional 60 litres under the boot floor. OK, you’ll have to cut down on the luggage if you’re looking to trade your Cayenne in, but that’s a perfectly useable amount of space. Running costs will be expensive - as you'd expect from an AMG. 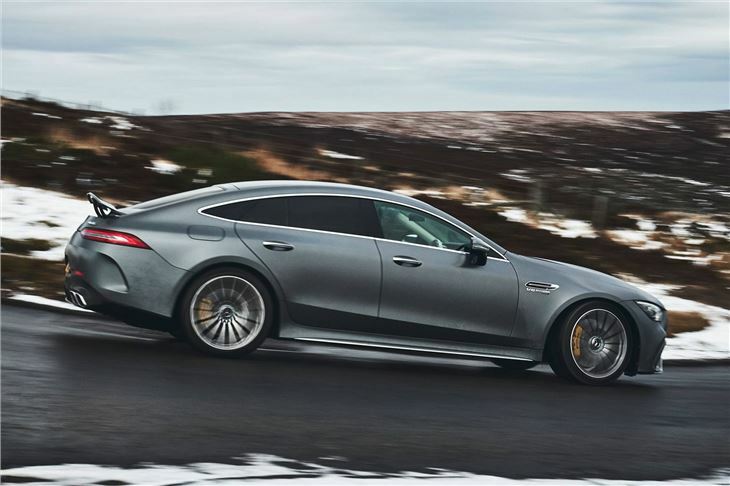 Officially, the GT 63 model returns 25.2mpg, and this'll soon drop to teens should you regularly exploit all of its performance. During motorway cruising, though, we expect mid-20s mpg should be fairly achievable if you're light with the throttle. 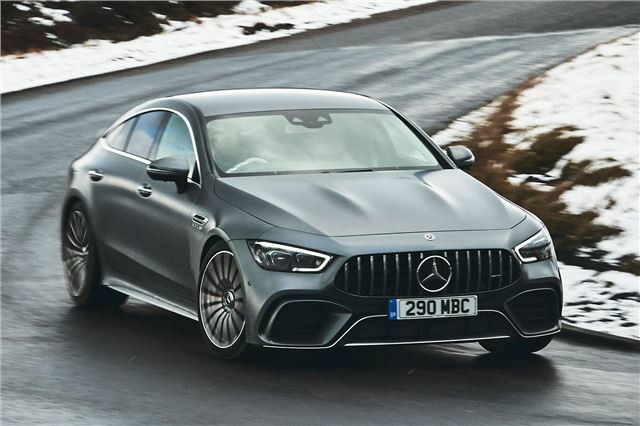 Just like the recent BMW 8 Series, the Mercedes-AMG GT 63 is a niche player that, in objective terms, doesn't make a great deal of sense. We really rate the Mercedes-AMG E 63 S and, for most buyers, that'll do a far better job of transporting the family at speed and in comfort. 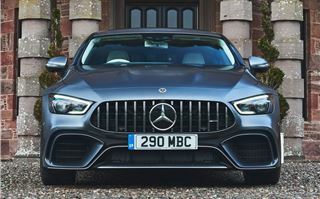 Unlike rivals like the BMW 8 Series and Porsche Panamera, the AMG GT Four Door is only available with a hunking great petrol engine, meaning it's hard to justify for high mileages, too. If you're thinking objectively, though, you probably wouldn't be looking to spend £120,000 on a car in the first place. The GT 63 is a feel-good car, though - with a superb interior and space for all the family. It's not as practical as an SUV - or an E 63 estate, for that matter - but it really makes a statement on the design front. It's also incredible to drive - sharper than an E 63, and much much ﻿better than any SUV. 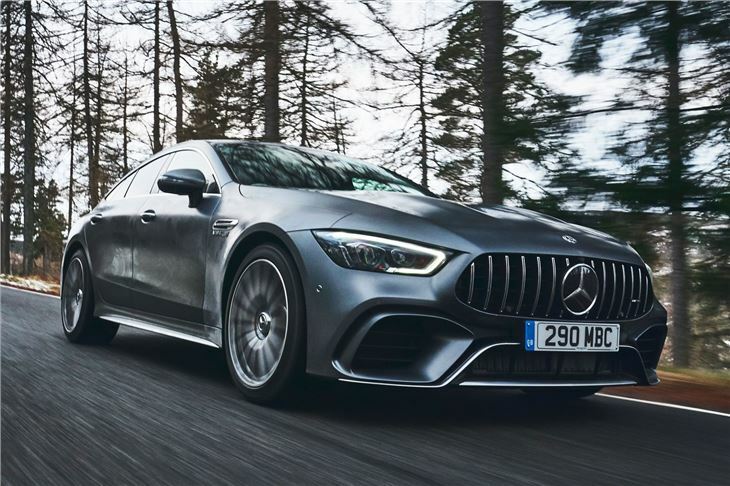 The Mercedes-AMG GT 63 Four-Door is on sale now with prices starting at £121,350.